The Takatoku 1/100 scale Valkyries as a whole are a lot harder to come by than the 1/55 scale version. Except for the Hikaru VF-1J ST. This appears to be the only one that keeps coming up on the sites I usually buy from. I hope to add a few more of these to my collection next year. This is actually my first Takatoku Valkyrie. I actually added the brown cannon fodder 1/55 scale this year as well from David’s trip to Japan. Before this I only had the 1984 Bandai VF-1A, so it is nice to have one of the original Takatoku toys that started it all. I consider the these the gold standard of robots from the 1980’s. The toy captures the robots from the anime in great detail. The VF-1J looks fantastic both as a robot and a plane! The toy is solid with a great design and fun to transform. Normally when the robot looks good the form suffers. But this is definitely not in this case. The Valkyries easily outclass any transforming robots from the 1980’s with their perfect transformations(kanzen henkei). Plus it helps that the anime was one of the better ones to watch in 80’s. I like this particular color scheme as I can imagine an actual combat jet with these colors. 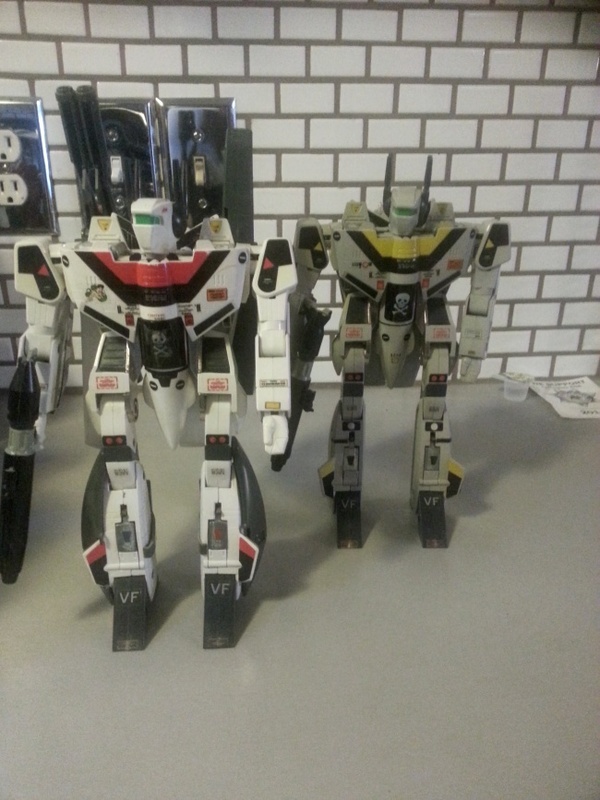 Here are two VF-1J’s “Hikaru Ichijyo” versions from the Macross series. One is the Takatoku deluxe version, while the other is the smaller, ST version. I cannot remember where I purchased the big one – I’m going to guess Japan, 1985. The ST one, on the other hand, I vividly remember purchasing it at Longs Drugs in Burlingame (of all places). I remember when there was this big robot craze in the 80’s, you could find these toys in the most unlikely of places. I think my cousin mentioned that he bought some Transformers from a carwash. 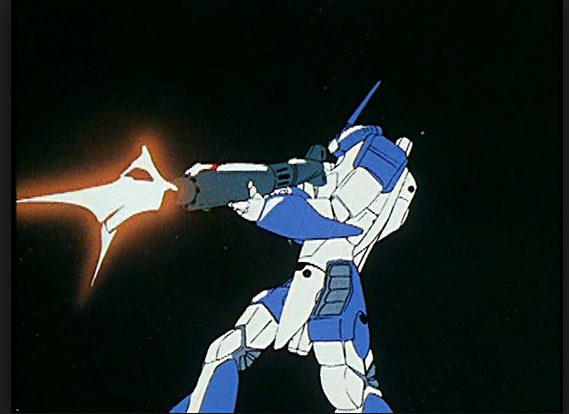 Anyway, the cartoon still is a picture of the VF-1J with the add-on armor. When has this armor, however, he cannot transform into a plane. 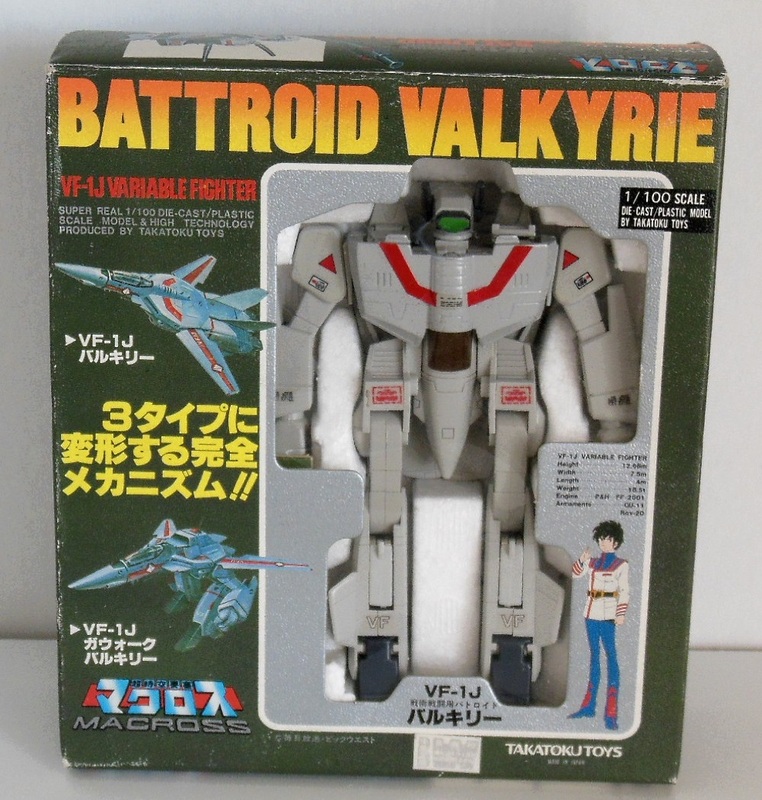 This is the VF-1S Armored Valkyrie and I thought I got this as a set but looking at my old handwritten notes, I got the armor for 25 dollars in Japan in 1985 and the VF1S in Hong Kong in the same year. During my last trip Japan trip 2013, I saw this in a 2nd hand store for about 140-150 (I think) and I was thinking of getting this for my cousin but I noticed that the plastic was starting to yellow and I so, I ended up getting him the Orguss. 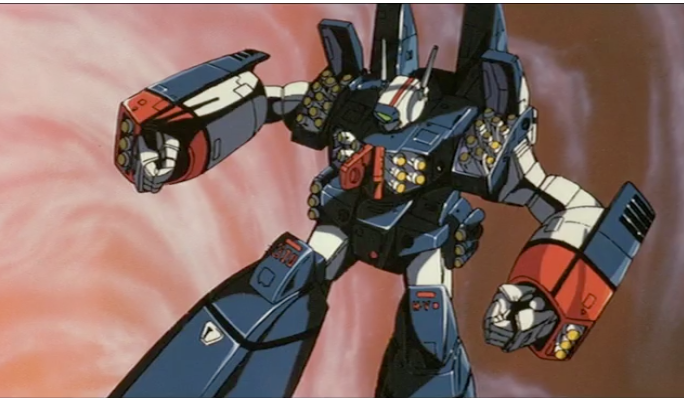 In the Macross cartoon, you see the armor is on the VF-1J as showing in the cartoon still (and not the VF-1S as shown below). 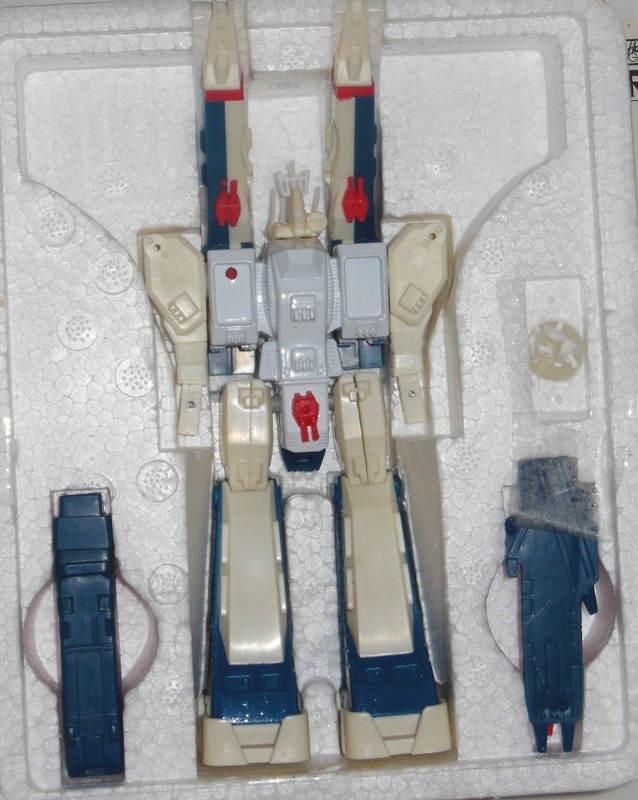 Here’s probably the holy grail of the Macross collection – the original Takatoku SDF-1. 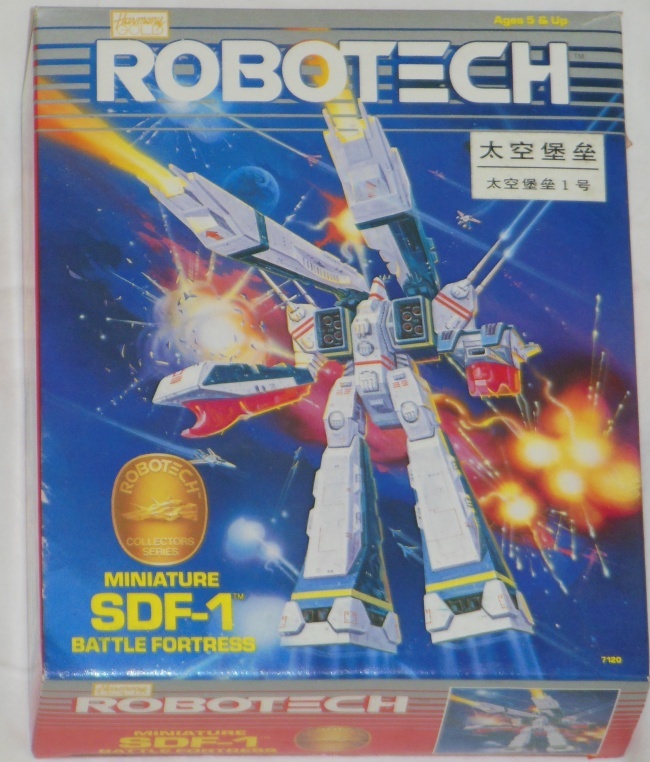 Actually, I do not think they have re-issued this toy under the Bandai or Yamato line (unlike the various VF jets). I bought this in Hong Kong in 1983 and I was very, very happy to have purchased him. When I look back at that trip to HK, I really remember there were more toy stores. When I went again in 2011, I didn’t see anywhere near the volume that I recalled as a child. I do remember though, that HK used to be a big maker of toys but not so much anymore and perhaps, that has something to do it. 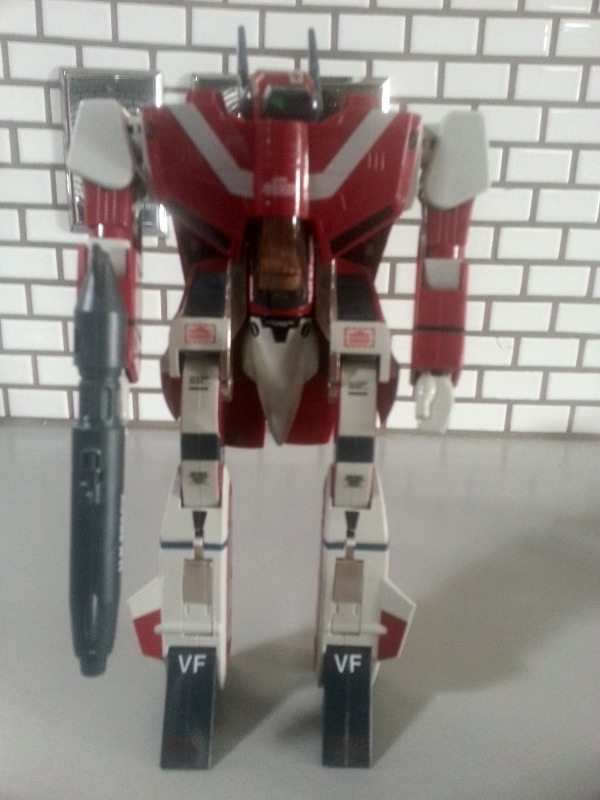 Here’s another Bandai re-issue that I couldn’t get as a kid – this time the red “Miria” model VF-1J. Basically, the background story behind her was that she was originally sent by the Zentradi’s to kill Maximillian Sterling – the ace pilot of the Earth Forces. She grew to fall in love with him and they eventually got married, had a child and she ended up fighting along side the Earth forces against her motherland – the Zentradi Empire. This red VF-1J depicts her plane. What’s fascinating about this (especially in the context of a cartoon) was the very adult idea that love could conquer all. You never saw such depth and meaning in U.S. cartoons and that’s why I grew to love Japanese anime – they were so much more sophisticated in story and plot line and overall, animation quality. 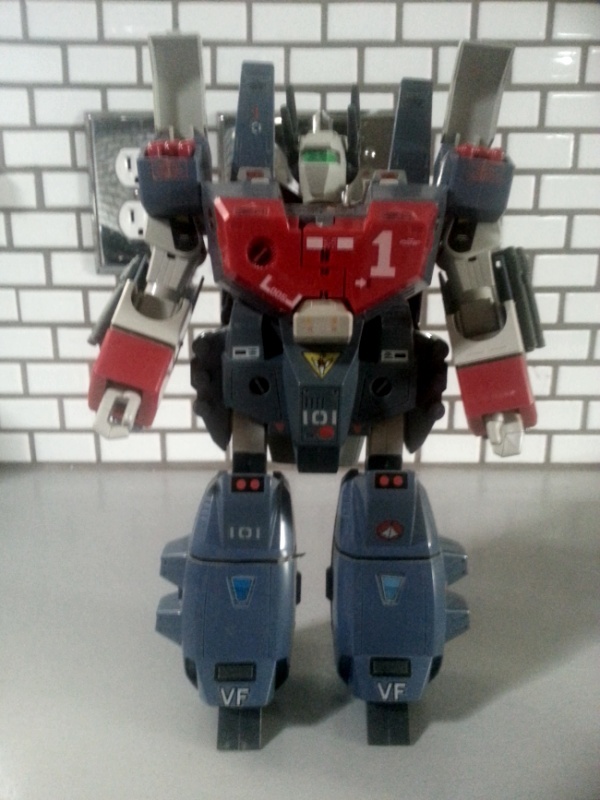 This one’s a Bandai re-issue of the blue VF-1J “Max” model from the Macross series. I never could find the Takatoku versions as a child but I was able to find the Bandai re-issues from the early 2000’s. Bandai and Yamato has since made tons of re-issues. 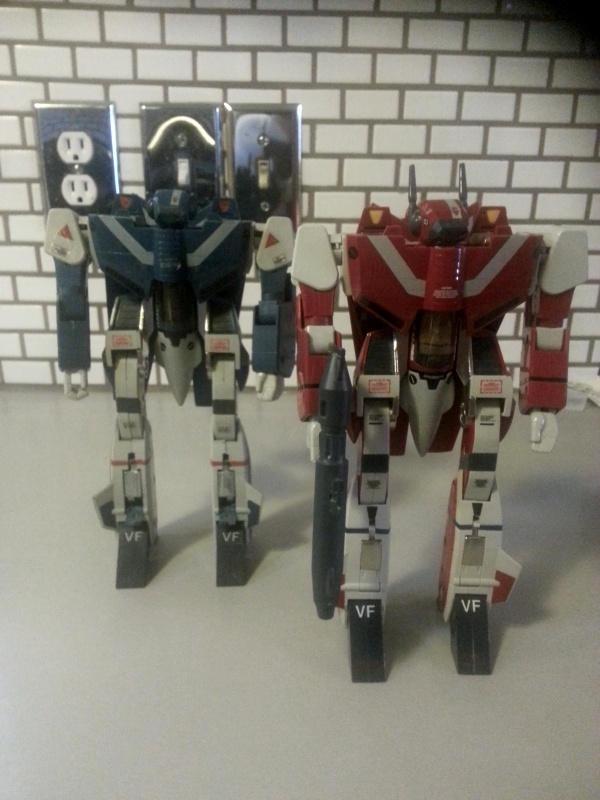 Below are the “Max” and “Meria” VF-1J’s from the Macross series. I vividly remember wanting to have these as a kid to complete the collection but I didn’t see them on my various trips to Japan. 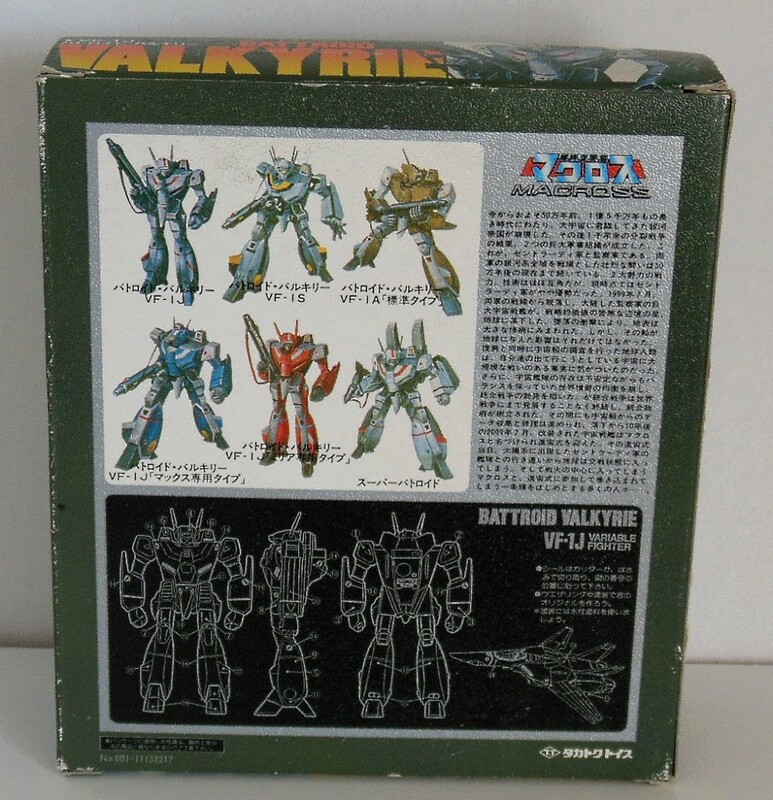 I didn’t realize until later that the original maker (Takatoku) went out of business in the early 80’s and the molds were purchased by Bandai. I’m going to guess that Bandai hadn’t yet gotten around to re-doing these two until later. Anyway, these are Bandai re-issues that I purchased in the early 2000’s. I’m glad I have them as I now have a complete Macross collection. 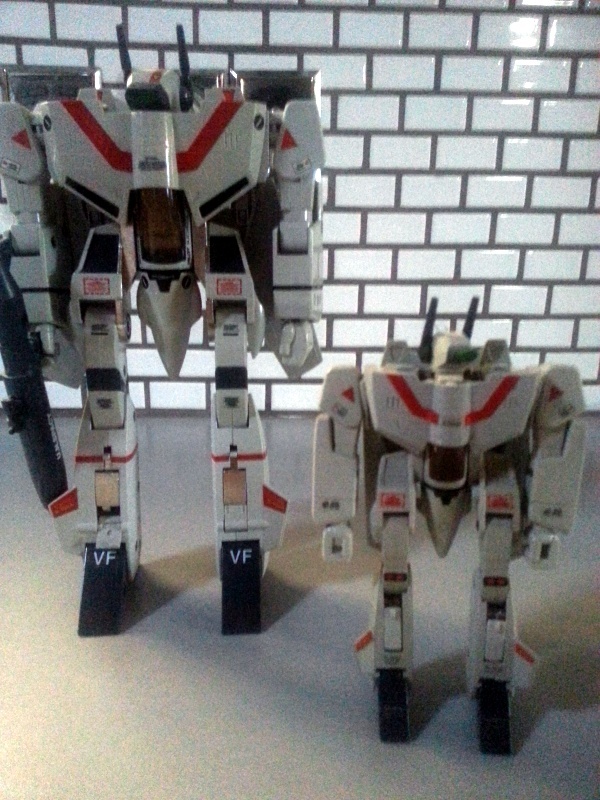 Below are the two variants of the VF-1S – the “Strike Valkyrie” and the “Roy Fokker” model from the Macross series. The Roy Fokker model skull and crossbones insignia is actually modeled from an actual U.S. Navy squadron – VFA-103 “The Jolly Rogers.” The VF-1S “Strike Valkyrie” is from Bandai while the VF-1S “Roy Fokker” is from Takatoku Toys. I believe I purchased the “Roy Fokker” model in Hong Kong in 1983. During my last trip to Hong Kong in 2011, I tried to look for toy stores in the malls but there just didn’t seem to be same amount of volume that I remembered. It’s also possible that these stores are now for adults like me and maybe in less traveled/less touristy areas. 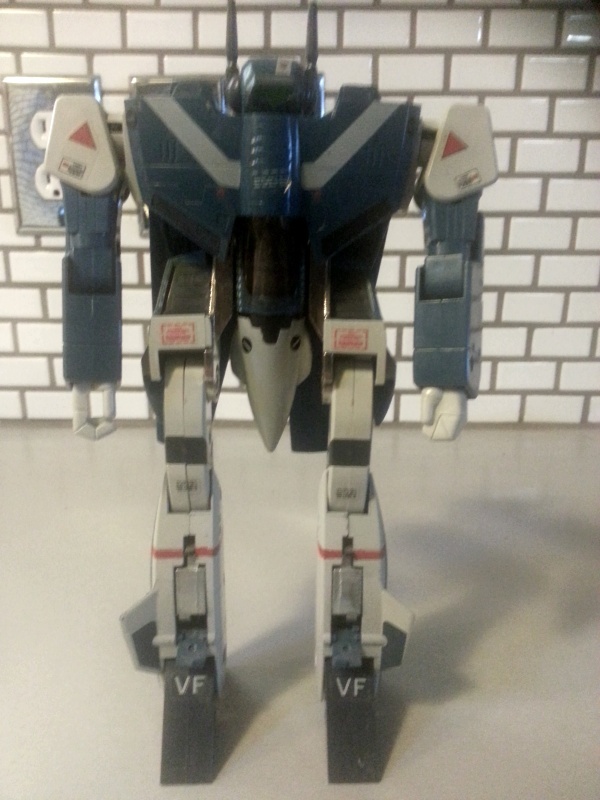 Both VF-1S and the Strike Valkyrie, I purchased in Japan 1985 for 20 dollars each. I’ve finally gotten around to my Macross box and I took a group picture. 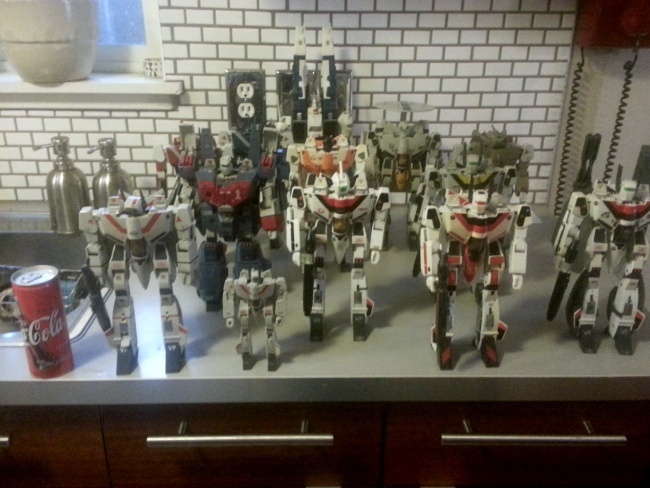 Pictured is the entire collection from the Macross series (except for the few Destroid Defenders that I wasn’t particularly in to). These are probably my most favorite of all my entire collection. I don’t think I could ever part with these as these were such a big part of my child hood. I grew up with the cartoons and I purchased the toys while on various trips to Japan. 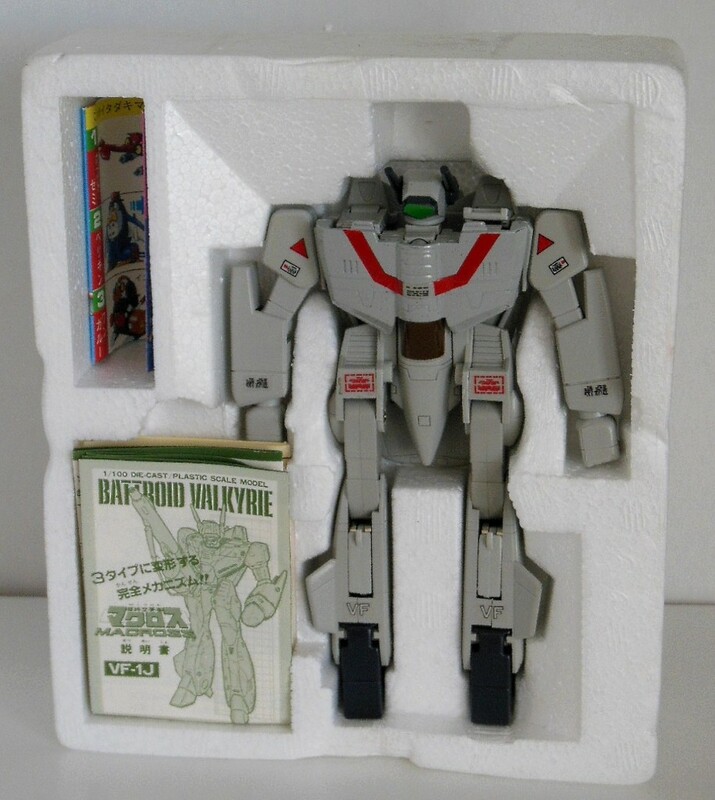 I also received the brown VF-1A from my mom for Christmas in 1983. I remember it was almost a hundred dollars back then and I was VERY surprised she went all the way to Japantown to get it for me. I’ll never forget that. The SDF-1 DX 1/3000 scale is my holy grail for robots. I have bid on this guy several times, but I still don’t have one. Having the smaller ST 1/6300 scale robot provides me some solace. But displaying this one really doesn’t have as umph as the DX. I really hate how the white plastic parts yellow with age. I have to dig around and find out why so many robots yellow after a while(L Gaim, Macross Valkyries, and the SDF-1 for starters). Grey would have been a lot better choice for this robot. I guess they use cheap plastic in Japan. I remember my Super Nintendo Entertainment System SNES was grey and it yellowed too. This is a nice little piece. You can tell the how white it was suppose to be when you see the metal part in the middle. Like most 80’s robots, it is not very poseable. There is not much detail on the ST version. The Takatoku Storm Attacker Construction looks identical except it has black plastic cannons instead of red, the shoulder cannons are not included(even though the box images and instructions indicate otherwise), there is a yellow painted outline for the chest pieces and grey plastic instead of white which looks a lot nicer. I am tempted to get that as well. Anyway, Macross/Robotech was one of the main reasons I am still into the whole robot genre as the cartoons kept going for a few years. 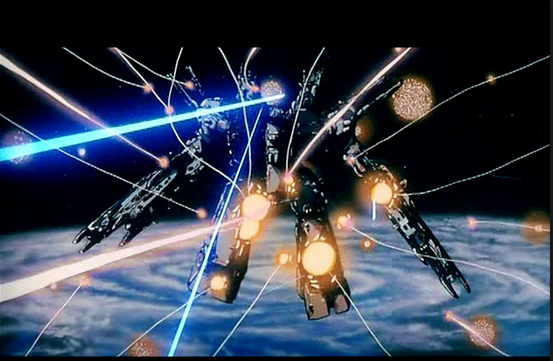 As Shogun Warriors faded for me, I got into Macross, Godaikins, and Transformers. 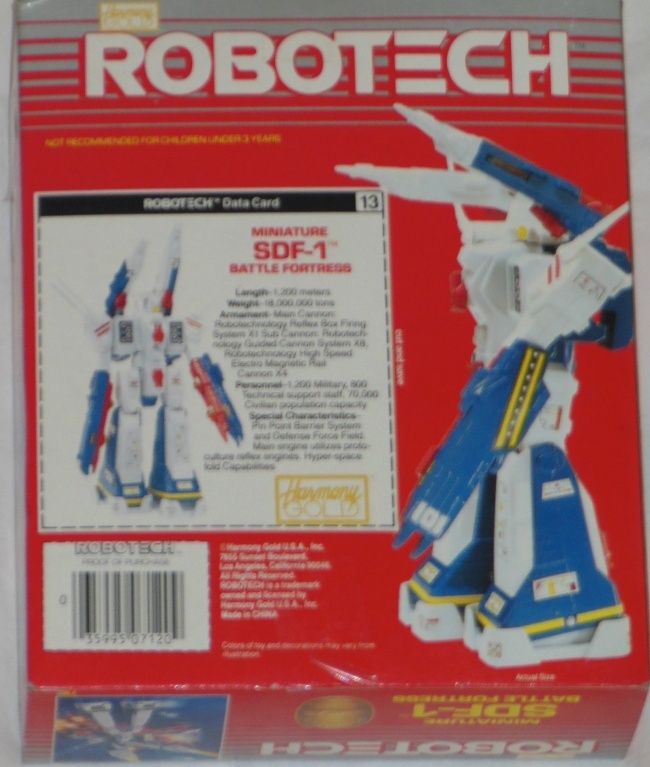 I really did not have any Robotech robots until I got the G1 Transformers Jetfire for $30 down at Talbot’s Toys in San Mateo. 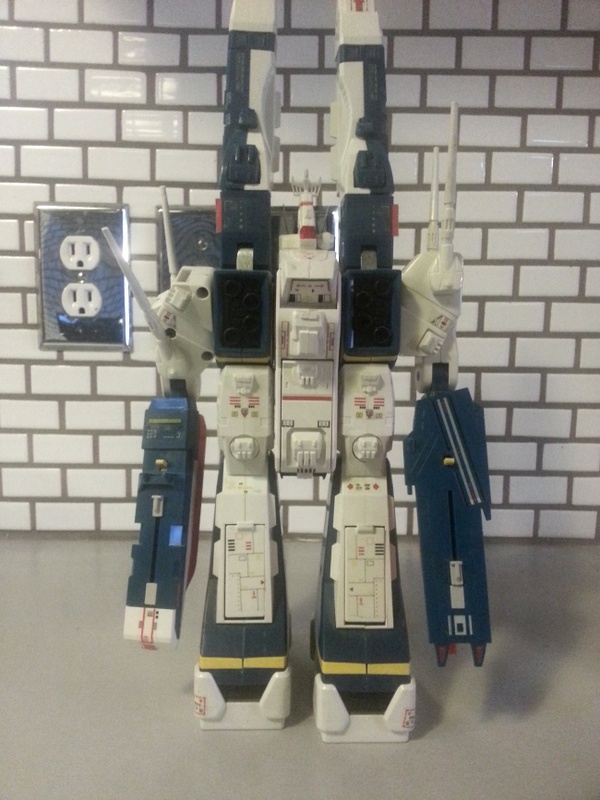 Takatoku and Bandai Valkyries were like $80+ in the 80’s in Japantown, so Jetfire was a bargain. Most of the time, I just went to my cousin’s house to enjoy his Valkyrie collection. It is quite impressive. He has them all, but 3 are reissues. I hope he puts out his Macross robots soon. 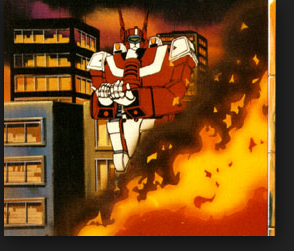 Here is intro to remember Robotech. Its funny how the instructions are still in Japanese in the US release of this toy. 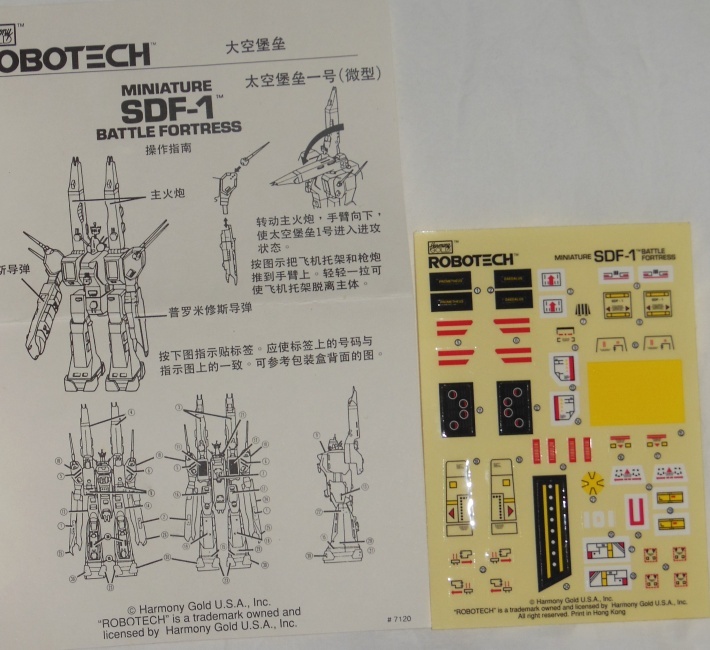 I would be tempted to get one of the newer SDF-1 below, but they are a bit beyond my price range.